Don't let the name frighten you! Chili with a Choke is definitely not your mama's chili - at least not yet! But we did a few things different with this delicious chili. Yes! 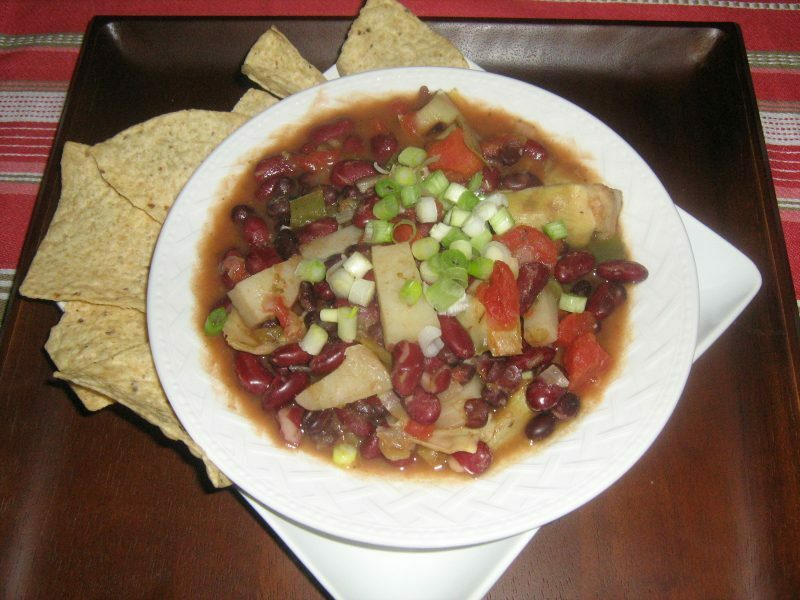 We added artichoke to this chili as well as something else you typically don't find in a chili recipe - potato. The delicious artichoke lends a slightly tart and tangy edge while the potato helps give the dish a little more body. In any event, you will want to try this chili recipe because it tastes great and it's good for you too! So grab some artichoke hearts and some potatoes and everything else you need and cook up a steaming pot of chili tonight! The distinct flavor and sturdy body of this artichoke chili makes it one of our favorites. Not only that but you get a whopping 24 grams of protein in every serving! We hope you will like it as much as we do! Let us know what you think! We are always happy to hear from you. Heat the olive oil in a large stock pot or Dutch oven over medium heat. Add the garlic and onion and cook until onion is tender (about 5 minutes). Add the green chilis and green bell pepper and cook for another 5 minutes. Add the beans, artichoke hearts and dried seasonings, stir well and add the vegetable broth. Squeeze in the lime juice. Bring to a boil. Reduce heat, add the diced tomatoes and simmer for about 15 minutes. Ladle into serving bowls and garnish with the sliced green onion. You might also like a few tortilla chips crumbled on top, before you add the green onion.